Two of Rebeca's pieces are featured, and her shop is named "Best Intimidating Jewelry" in the Chicago Reader's annual Best Of awards. (Poseidon's Embrace is shown in the online version and It'll Always Be Sears to Me appears in the print edition). Rebeca's chainmaille scarf is featured in the Christmas in July section. Poseidon's Embrace wins the award for Best Jewelry Making in the first annual Craftys Awards. 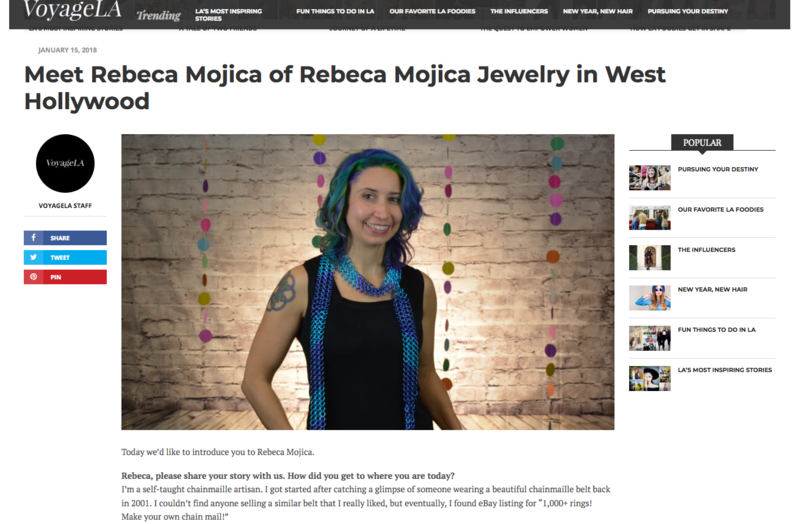 Rebeca Mojica and her work are featured in this 5-page article discussing Rebeca's signature chainmaille style, the beginnings of Blue Buddha Boutique, the chainmaille jewelry industry in general and the opening of Blue Buddha's brick and mortar retail store. Profile of jewelry artist Rebeca Mojica and her company Blue Buddha Boutique. Rebeca's Celtic Filigree Pendant appears in the Trends 2014 section. Rebeca's jewelry at the Museum of Contemporary Art Gift Shop is mentioned in the article Perfect Presents at Museum Gift Shops. "…Favorites include tabletop items from Jia, jewelry from Chicago's Rebeca Mojica and flatware by famed architect Zaha Hadid." Rebeca's Shaggy Scales necklace is shown on the cover. Rebeca's chainmaille mesh ring is featured as part of the Local Wares section. "If a diamond is forever, what does chain mail say?" Rebeca's haute couture piece “Poseidon's Embrace” is featured as part of the gallery section of this issue. Visit www.artjewelrymag.com/gallery to see her piece and many other inspiring creations. Rebeca's Poseidon's Embrace necklace was featured at the "One of a Kind" Art & Craft Show at the Merchandise Mart. It is photo #14 of 35 in the slide show at MetroMix. This item was also the featured art work on the show's signature shopping bags. Rebeca's “It’ll always be Sears to Me” sculpture was featured in the Beyond Jewelry section of this issue. Rebeca spoke with Mona Hair and Dr. Gail Devoid and answered listener questions in a 3-part video/radio interview. Rebeca tells how she discovered chainmaille and what inspires her as an artist. Rebeca Mojica was a featured artist on Art-onTV this fall. During the interview, she talks about how she got started in chainmaille and shows off some of her fancier pieces, like the Sears Tower sculpture and the micromaille necklace Poseidon's Embrace. The craft scene is exploding in Chicago, and this article describes how the Chicago Craft Mafia (part of the national Craft Mafia) and the Renegrade Craft Fair are supporting the new generation of local crafters and helping define the industry. At the top of the article is Blue Buddha Boutique founder Rebeca Mojica with her black chainmaille scarf.